With FDIC coverage shrinking, a huge wave of corporate cash could make a move. A perfect storm could be brewing for treasuries with lots of cash. Companies have unprecedented amounts of accumulated cash sitting in bank accounts, protected by unlimited Federal Deposit Insurance Corp. coverage if the accounts don’t earn interest. But the Transaction Account Guarantee (TAG) program that provides this safe harbor is set to expire at year-end. Normally the cash could flow into money-market fund (MMF) accounts, treasurers’ favorite alternative to bank balances, but the Securities and Exchange Commission is weighing new regulations for money funds that many treasury executives say would make them toxic. 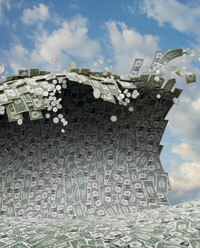 A huge wave of money could be rolling toward an unknown shore. Safety is not threatened, but moving that much cash requires planning.